This article introduces a solution for data collection and remote control with WIZnet chip W5300. In modern data collection field, more and more scene collection devices need to expand network functions to realize remote control and data transmission. Ethernet has been applied widely because of its advantages of low cost, easy integration, and large distance of transmission. In conventional Ethernet solutions, CPU often connects with a Physical layer interface chip, and all the communication protocol should be loaded in CPU. This solution needs complicated program and takes a long time to debug and test. Because the network protocols are usually very big, it is not so stable after coding into software. It is not suitable for fast development and stable running. Also, customers often have new requirements, then it is hard to update frequently with this software solution. Therefore, one solution is to make the processing of network protocol independent from system’s processor, letting application program and input/output be executed by different hardware to reach several aspects of requirement. It divides the processing of network protocol into a control part executed by a particular processor and a hardware circuit part. The advantages of this solution are short period of development and high flexibility. Also, it can increase the stability and reduce the payload of CPU effectively, and the modular design is easy for future upgrading. 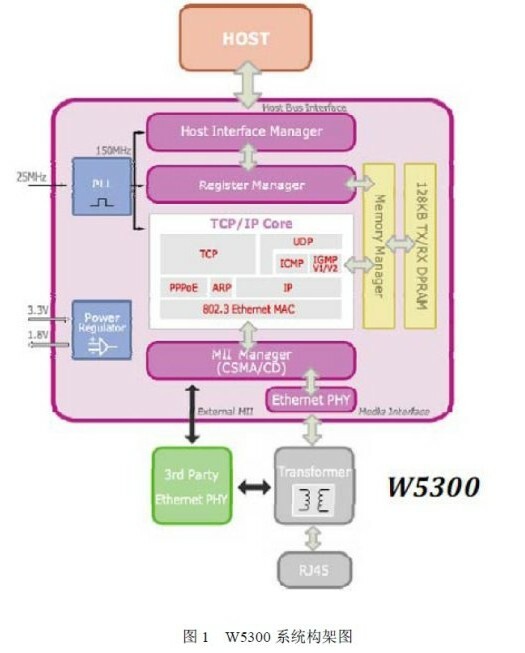 The hardwire Ethernet protocol chip W5300 solves this problem perfectly. Also, it has integrated the highly matured TCP/IP protocol stack, Ethernet MAC layer, PHY layer etc. It also supports many protocols such as TCP, UDP, IPv4, ICMP, ARP, IGMP and PPPoE. These protocols have been verified in many fields. The chip supports 8 independent Socket channel. The internal 128K sending/receiving buffer can expedite the data exchange. The biggest effective communication speed can reach 70Mbps (in DMA mode). Using W5300 doesn’t need to concern about Ethernet control. You only need to do some simple Socket programming, just as simple as accessing an external memory. W5300 supports 8bit/16bit data BUS. It reduces the workload greatly in hardware interface design and network programming. Also, it can realize a remote data communication system with reliable running. It can be used widely in various security detection, media and video transmission and remote information transmission. The picture below shows the system structure of W5300. For example, we introduce the Ethernet technology into embedded system with DSP core. 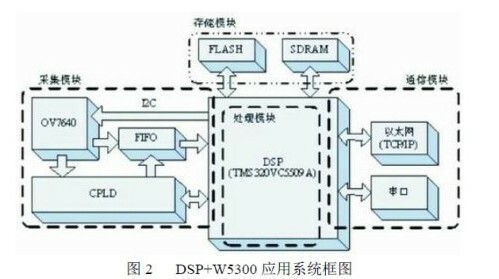 Then the DSP chip will have the function of network connection, and PC can do the data exchanging with DSP embedded module through NIC. Here we give an embedded network control system which combines TMS320VC5509A and W5300. The application program is executed by DSP, and the network protocol processing and data transmission is implemented by W5300. When you design the system, you don’t need to concern about the detail of network protocol. To realize the connection with Internet, the only thing you need to do is to explain and execute the received command and data, and you don’t need the OS support. The system design is shown in the following picture. This system sends a collection command through CPLD, and CPLD controls CMOS image sensor to write image data to FIFO. At the same time, DSP transfers the image to SDRAM through DMA to process the image. After processing, the system sends the result to PC or other devices through Ethernet. Relying on the perfect TCP/IP processing function of W5300, DSP can connect to Internet without OS support. W5300 has many advantages such as simple, reliable and cheap, and it has a bright future. Of course, W5300 can also work perfectly with control unit like 51, AVR, PIC, and ARM, and offer you fast and reliable network connection function.